The small city of Palangkaraya in Central Kalimantan has been in the news a lot lately. It has been reported in the media that it will be chosen as Indonesia’s new capital, with an announcement due later in the year. So it might be the right time to visit one of Indonesia’s best-kept secrets. There is plenty to do and see in Palangkaraya, and it must be one of the friendliest towns in all of Indonesia. The city is a melting pot of cultures, including the indigenous Dayak majority and the Banjarese, who established a presence there as traders several centuries ago. During the seventies, President Soeharto was keen to move people from overpopulated areas of the archipelago to less populated areas like Palangkaraya. As a result, many Javanese, Balinese and others moved there. This fascinating cultural mix is very much on display during Palangkaraya’s annual Isen Mulang, held in May each year. A key focus of this festival is dance. There are 50 dance acadamies in the city, and dancers from other areas also perform, so the competition is very fierce. At other times of the year, you can visit some of local dance academies, such as The Spirit of the Hornbills, and they will arrange a traditional dance and music performance. Palangkaraya is also a key base for seeing Indonesia’s beautiful endangered orangutans, which can be found in the forest not too far from the city itself. You can hire a comfortable private boat and explore the nearby waterways early in the morning. You are almost guaranteed to see some of these primates on one of two Islands where they are being prepared to return to the wild. Borneo Orangutan Survival Foundation (BOS) also has a very effective program, which you can visit. Nearby Sebangau National Park is larger than the Island of Bali. It is a wonderful ecological reserve and, you can explore by boat and cruise out to the black water lakes, stay overnight in a Dayak village and even set camera traps with the rangers to track the clouded leopards. 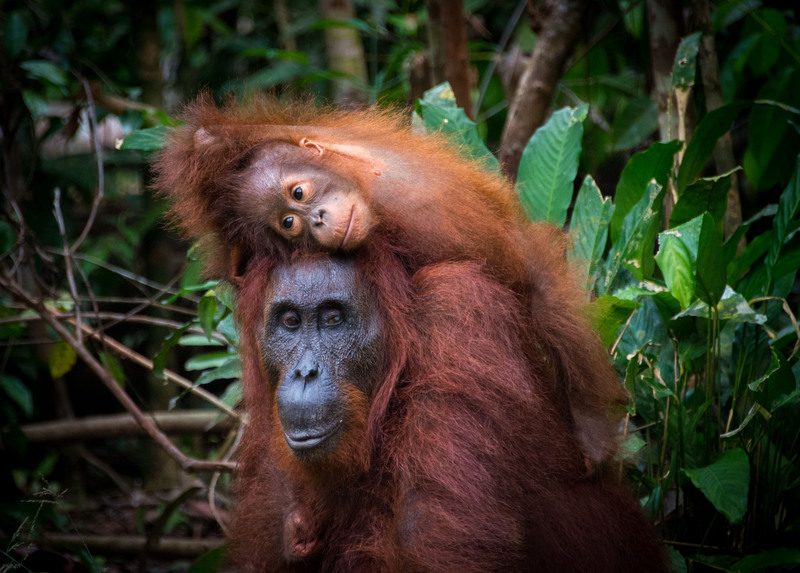 There is a large wild orangutan population in Sebangau as well and guided treks with rangers can be arranged. An unforgettable experience is to take a boat cruise on the Runyan River. The beautiful, ancient waterways of this area are a true highlight, and cruising along the Wow Borneo boat combines nature with a bit of luxury. Wow Borneo is Australian/English owned and operated very professional organisation that has operated for 8 years in the area. The boat crew including the very knowledgeable guides make the experience very educational as well as engaging and a lot of fun. Most of the boats have cabins, so you can venture deep into the river system and sleep on board. For me, though, the most interesting thing about visiting Palangkaraya is the opportunity is to meet and learn from the original inhabitants, the Dayak people. With a good local Dayak tour operator and guide it is easy to arrange a trip into one of the Dayak villages, where you will be welcomed like family, as they still have very few visitors. You mainly stay in three and four star hotels or homestays, and there is a large variety of good restaurants serving Chinese food as well as traditional Dayak food, which is delicious. Palangkaraya is very accessible from Jakarta with direct flights taking just over an hour from Jakarta on Garuda and Lion Air. I highly recommend Yun, who is a young Dayak female tour guide. She can take you to all these places, and more, and is a mine of information about the local area, the waterways and the Dayak culture. An amazing Borneo adventure awaits you.